To view the ruins of the Ford estate, follow the former entrance drive up Haven Hill. The road is closed to traffic just beyond the park maintenance buildings and parking is not now allowed at the gate. You can use a bicycle to reach the top of Haven Hill but the end of the entrance drive is incredible steep and most people end up walking their bikes to reach post No. 7. 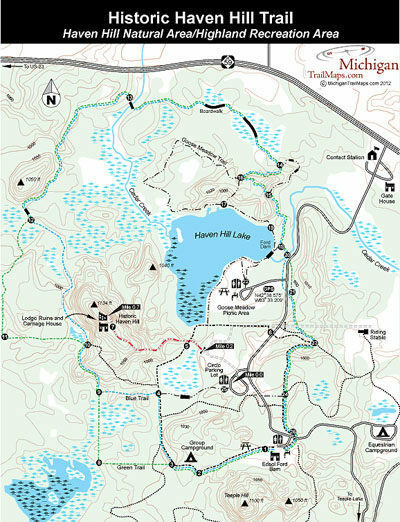 Thus, a round-trip hike of 1.4 miles is required from the Circle Parking Lot to the top of the hill to view the ruins. The best time to search for the tennis courts, that featured clay imported from France, pool and the toboggan run is late October or early November after the leaves had dropped and visibility improves on the heavily forested hillside. Begin at Circle Parking Lot where there is vault toilets but no source of drinking water. Head west along the paved maintenance drive to reach a locked gate within quarter mile. After walking around the gate, it’s a bit of a climb to post No. 7 at the end but well worth the view of the Carriage House. This impressive log lodge, designed as a smaller replica of the main lodge, is still standing perched on the edge of the hill and use to house Ford’s caretaker and his automobiles. 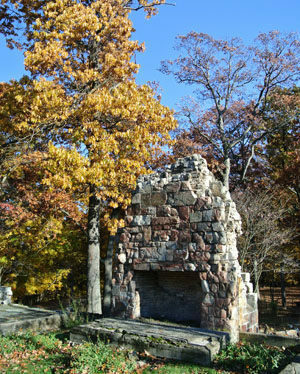 A little further up the hill is the foundation of the sprawling Haven Hill Lodge, reminiscent of ancient Roman or Greek ruins with one of the five massive Vermont fireplaces still standing. Foot trails lead down the ridge to what remains of the pool, tennis courts and toboggan run. Foliage now blocks much of the view on top but at the time Ford built his estate he enjoyed a 360-degree view that included Haven Hill Lake and many of the other lakes and forested ridges in the surrounding area.